Rooftop solar is attracting huge interest in the strata sector, with a number of solutions appearing for renewable energy production. Storage of this energy in batteries during the day allows it to be used at peak times at night. This has opened up a whole new range of possibilities for solar energy in strata. Tesla is largely responsible for the hype, with the launch of their accessible Powerwall battery into the Australian marketplace. However, Brisbane-based Allgrid Energy is also looming large in the media. 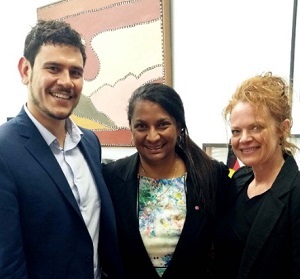 CEO Ray Pratt is pictured with Senator Nova Peris and Deborah Oberon, spokeswoman for Allgrid. Allgrid is an Indigenous-owned energy company that has partnered with UrthEnergy to compete head on with Tesla for the fast-growth solar energy market. They launched a 10kW solar storage system, Wattgrid, at the beginning of 2016, which they claim is 30% cheaper than the Tesla Powerwall. 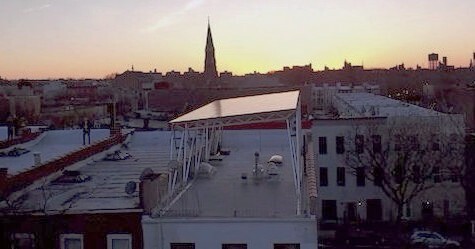 The biggest challenge for strata buildings is often finding enough clear roof space to make the most of solar energy. However, further innovations may be on the way. New York based Brooklyn SolarWorks and Situ Studio have created a canopy that elevates solar panels above precious communal space, or existing obstacles such as ventilation or hatches. Solutions like this may open the door for rooftop solar on many more strata buildings. For further reading on Allgrid see The Fifth Estate, and SBS [video], and for Powerwall see the Telsa website and their launch video. For more on solar canopies in Australia, keep an eye on Origin Energy's project in a car park at Westfield Marion.